This technique for making a miniature 'porcelain' slab vase relies on simple embossing of polymer clay. The natural porcelain color is easy to mimic by blending equal amounts of white and translucent clay (or porcelain, depending on the brand, the one shown is done with Premo! clay) . Adding this much transparent clay also makes the clay much more resistant to breaking, so allows you to make the very thin edges which suggest an object made from porcelain. This is a very simple project designed to give a beginner a project that experiments with texture and simple modern shapes. Embossed clay is shaped free form or around a cylinder, and the edges are pressed together. Once you've practised on a vase, move on to other 'porcelain' effect miniatures. Try lamps with pierced sides, night lights, or miniature houses in 'plain' porcelain. There are a wide range of objects which can be used to emboss patterns for modern miniature vases. Thin metal stencils, metal medallions and scrap trims, small rubber stamps, lace with strong patterns. Try a small fern leaf, or make patterns with a pin or an embossing tool. Try to use a pattern which is less than 1/2 the size of your vase height. If you wish, you can also try to create textures from woven fabrics. Wired ribbon works well, as does fine tulle. Try a number of objects on scrap clay to see which patterns you think will be most effective. To make a modern miniature vase, you will also need small amounts of white and translucent polymer clay in your favorite polymer clay brand, a clay roller, a clay blade or tissue blade , a dressmakers pin or sewing needle or fine pointed awl, and a baking surface. You might also want to have on hand some baby powder (talcum) as a release for your clay, and a round cylinder (brush handle, cylindrical bead) to use as a former for the shape of your vase. The object of this project is to experiment with making thin, textured vases from polymer clay. Small scale, thin stencils, (this one is from Black Country Miniatures) can be used to emboss raised patterns on polymer clay. The stencil needs to be pressed evenly into the clay using a roller, then peeled away carefully from the clay. You can also cut stencils with paper punches from thin mylar, acetate sheets, or baking parchment and use those for embossing clay. The stencils need to be thin enough to bend, or you won't be able to lift them out of the clay easily. If your embossing pattern has a shaped edge, you can use the tip of a fine pin, needle or awl to separate the clay along the line of your embossing. If possible leave the embossing 'pattern' as a guide while you mark the edge. You want your vase to end up being roughly the equivalent of 8 - 12 inches (20 -30mm) in your chosen scale. Plan your edges accordingly. If you wish, you can add perforations (tiny holes or shaped holes (hearts, shamrocks.....) to the upper and side front edges of your embossed clay while the clay is flat. You can use a pin, awl or paper punches to add cut outs. Ornamental scissors can also be used to shape the upper and side edges of your clay. Work on your design as much as possible while your clay is flat. Make sure your clay is rolled as thin as you can manage it, keep it less than 1/32 of an inch (.8mm) thick if you can. I chose to make a random embossed pattern using a stencil and a section of fine lace for the design shown here. I decided to add small pinholes to the scalloped edges of the design, keeping the overall pattern abstract and random. When you have a design that pleases you, use a clay blade to lift the clay carefully from your working surface trimming it to size before you cut it free. Once your clay is free, gently shape it into a rough cylinder, or shape it around a handle or cylindrical bead you have coated with talcum powder (or water or corn starch, depending on the recommended resist for your clay). Press the side edges together gently so they stick out from the side of your clay to make your first attempt easier to shape. Take care not to squash your design as you shape your clay. Handle it as little as possible. If pressing the vase body together at the edges destroys your embossed pattern, you can try to revive it by using a flexible form (like the lace shown here) pressing it into the edge with a large ended embossing tool or round ended toothpick. Make sure you emboss the pattern on the front side, as the back will likely loose any embossing once you press down on the clay layers. 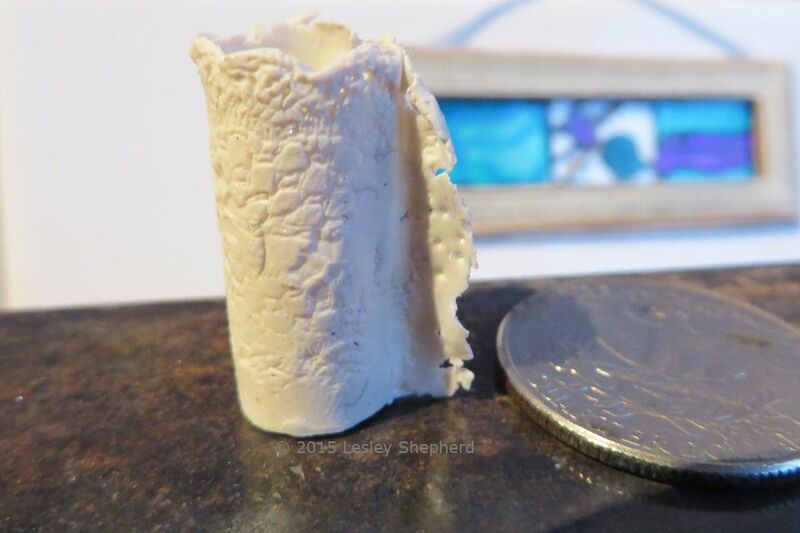 Set your embossed clay cylinder down onto a baking surface (I use a tile) and make sure it is straight or trim the base carefully so it stands upright. Shape the upper edge or the side join if you wish to give it a fluted or folded effect. Bake it at the temperature recommended for your clay brand. At this point it won't have a base, that comes in a second baking process. When the clay is baked, allow it to cool, then remove it from the baking surface and trim or sand it on the base to make it stand straight. Once you have it adjusted to stand properly, roll out a small amount of matching clay and press the base of your vase down gently into it. Use a pin, craft knife, or clay blade to trim the clay close to the base of the vase. Carefully insert another bit of clay down into the base of the vase from the top, so you seal the base of the vase on the inside using an embossing tool, and on the outside (using your fingers). Rebake your clay to join the base to the squared off cylinder of the vase. Allow to cool. Have fun with this technique. You can use it to make many 'art' pieces of polymer clay in dollhouse scale. It works well for flat serving dishes, as well as interesting modern wall tiles.